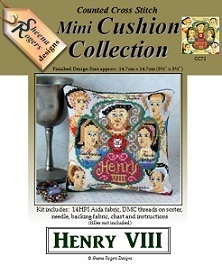 Henry VIII and his six wives feature in this mini cushion design, with a Tudor Rose placed in the centre. Each of the wives' names are backstitched onto the design and the mini cushion is filled with oppulent colours. Only whole cross stitch is required (so no fractionals), with baskstitch needed for the facial features and the lettering. This mini cushion cross stitch kit includes: 14HPI white Aida fabric, DMC stranded cotton threads ready-sorted on a card sorter, needle, black velvet backing fabric, b&w symbol chart and full instructions (cushion filler not included).